Here is a lovely family recipe that takes all the hassle out of preparing a hot-weather festive dessert. You can make this easy ice cream cake a day or two - or four! - in advance, and I promise your friends and relatives will love it. This recipe first appeared in my 2012 cookbook, and it was inspired by my aunt Gilly Walters, the wizardess who started Wedgewood Nougat in her home kitchen many years ago. Gilly is hands-down the best home cook I've ever met. Her exquisite food has inspired and delighted me for over 45 years, ever since I sat down at her table as a child, and scoffed myself sick on her feather-light scones. These days, Wedgewood is a thriving enterprise exporting its nougat and heavenly Angel's Biscuits all over the world. These are still made by hand in a hi-tech factory in the Natal Midlands, and the business - a model of social responsibility - is managed by my three cousins, brothers Jon, Steve and Paul Walters. Please choose a proper dairy ice cream for this cake, not the frozen ‘desserts’ that pass for vanilla ice cream. After you've taken it out of the freezer, let the cake stand at room temperature for 5–10 minutes, or until just soft enough to slice with a knife you've dipped in very hot water. How much lemon juice and icing sugar you add to the raspberry sauce will depend on how tart or sweet they are to begin with; adjust as necessary. If you're making the ice cream cake a few days ahead, wrap it tightly in clingfilm so it doesn't pick up any whiff of freezer. As I mentioned in the original intro to the recipe (see below) you can add other goodies of your choice to the mixture. I can recommend finely chopped dark chocolate, and a few drops of good almond extract. Take the ice cream out of the freezer and let it soften slightly. In the meantime, make the crust. Whizz the shortbread biscuits to a fairly fine crumb in a food processor. Place in a bowl, add the soft butter and stir well to combine. Wet the base of a non-stick 24-cm springform cake pan and cover with clingfilm. Tuck the edges of the plastic under the base, pulling it quite tight as you fasten it in the ring. Press the biscuit mixture evenly onto the lined base and refrigerate it while you making the filling. Using a heavy knife, chop the frozen nougat bar into pea-size pieces and cut the chocolate biscuits into big chunks. 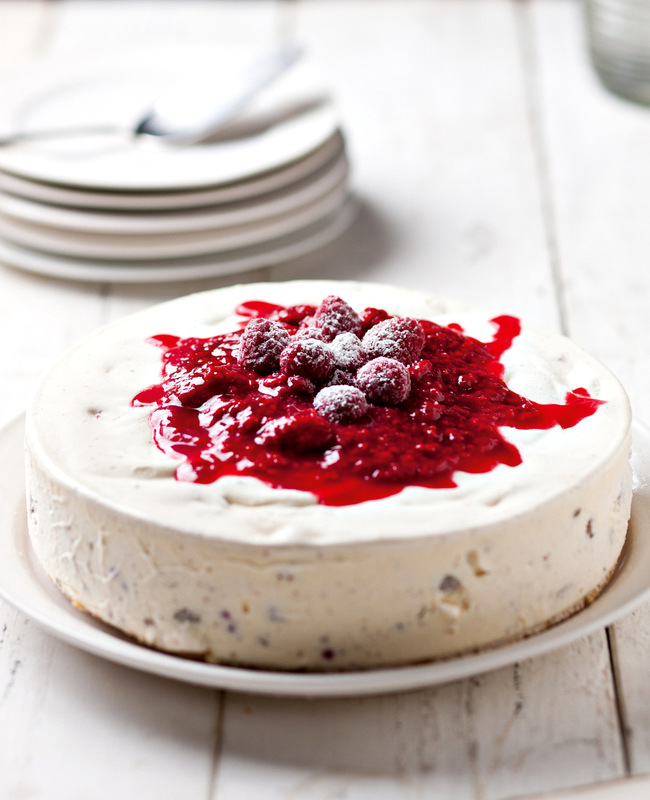 Whip the cream to a soft peak in a large bowl and, working quickly so the mixture doesn’t melt, fold in the slightly softened ice cream, nougat, biscuits and half the frozen raspberries. Tip the mixture over the crumb crust and, using a spatula, swirl the top into generous waves and ripples. Cover and freeze. Put the remaining raspberries, the icing sugar and a squeeze of lemon juice (see my notes above) in a small pan, bring to a gentle simmer and cook for 2–3 minutes, stirring occasionally. Using a stick blender or food processor, whizz to a purée. Strain the sauce if you’d like it fine, or leave it slightly rough. Set aside to reheat later. Loosen the edges of the ice cream cake by briefly pressing a hot kitchen cloth against the sides. Slip a spatula or palette knife between the crumb base and the clingfilm and loosen it by using gentle levering movements, turning the pan as you go. Slide the cake onto a plate or cake stand, leaving the base and clingfilm behind. Cut the cake into slices using a knife dipped in boiling water. Reheat the raspberry sauce and serve separately, in a pretty jug. Or you can leave the cake whole, and pour the hot sauce all over the top, as shown in the picture above. Makes 1 x 24 cm 'cake'; serves 8-10. Be still my heart! That looks so good! Can I make the cake in advance for xmas and freeze?